Arms. 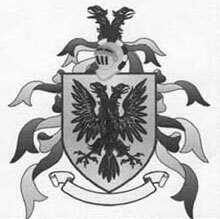 An eagle displayed, with two heads, sable. Crest. An eagle's head, erased. The Browne family arrived in Ireland in 1170 in Strongbow's time, and were soon established in Galway and Mayo. They left several important seats such as Mounthazel, Moyne, Rockville, Breaffy and Castlemacgarret. Philippus de Browne, is said to have come to Ireland in 1170, and, in 1172, was appointed Governor of Wexford. In 1178 he went to England, and soon after returned with 60 armed knights, and was a leader at the siege of Limerick. He had three sons, William, who settled in the territory of Clanmorris, County Kerry, and Walter, who settled in County Galway, where his posterity still remain, the destination of the third son is not mentioned. The principal families of the name at present in the province, are those of Ardskea, Gloves, Kilskeagh, Mounthazle Moyne, Rockville and Tuam, in County Galway, and Ballyhowly and Castlemagarret, in Mayo.